Duke and Tulane last faced each other on September 24, 2011 in a game Duke won 48-27 at Wallace Wade Stadium. Tulane leads the overall series 2-1 with wins over Duke in 1964 and 1973. Duke defeated Kansas 41-3 last week, while Tulane defeated Southeastern Louisiana 35-20. Executing on special teams, achieving balance on offense and ball hawking on defense will be the paths to success for Duke this Saturday. In Tuesday press conference, Head Coach David Cutcliffe emphasized his desire to pin teams inside the 15 yard line on kick-offs. Look for Duke to use Jack Willoughby to hang the ball up just in front of the goal line in an effort to force Tulane to start their offensive possessions inside the 20 yard line. Moreover, Tulane is averaging 30.6 yards per punt on the season so Duke has an opportunity to exploit this weakness to win the field position battle. When talking Duke and offense, balance is the key. Duke is averaging 510 yards offense per game through three games with 262.7 of those yards coming via the run game and 247.3 yards via the passing game. Not surprisingly, everyone is buzzing about the emergence of freshman running back Shaun Wilson and his record setting performance against Kansas; however, Duke starts three talented receivers who have the skills to burn the opponent's defense. Taking a look at the season statistics to date: Max McCaffrey has 16 receptions for 178 yards and two touchdowns; Jamison Crowder has 16 receptions for 177 yards and two touchdowns; Issac Blakeney has 13 receptions for 173 yards and three touchdowns. Add in proven upperclassmen running backs Josh Snead and Shaq Powell, and Duke has a laundry list of options the opponent must account for when designing a defensive game plan. Involving all the offensive options to keep Tulane guessing is how Duke will achieve success. On defense, Duke must pressure Tulane quarterback Tanner Lee and force him to make mistakes. Lee has thrown six interceptions in three games so it is imperative Duke mixes up coverage looks to confuse Lee while simultaneously bringing the heat to hurry him up. If Duke can force Lee out of his comfort zone, odds are he will make mistakes. It is up to Duke's defensive playmakers to capitalize on Lee's mistakes. 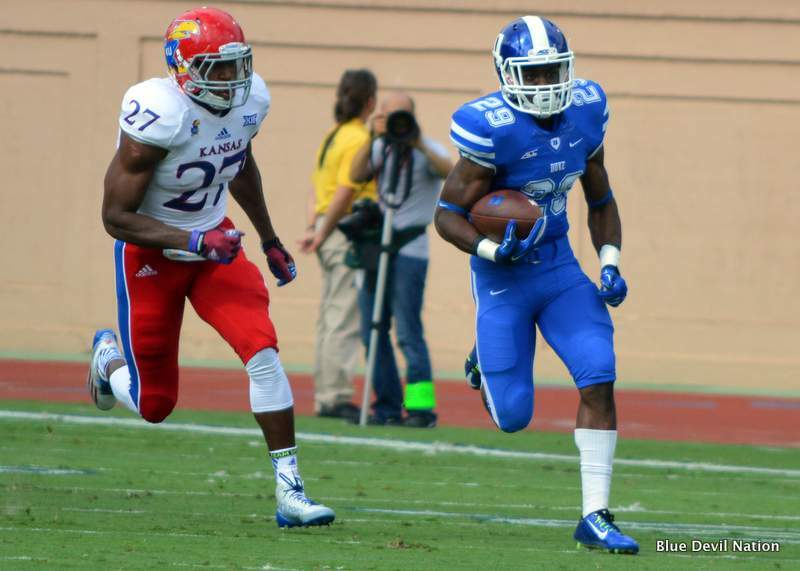 Turnovers and Tulane's speed are the two things Duke needs to be concerned with on Saturday. Duke has not turned the ball over in their first three games and that needs to continue for Duke to achieve success against the Green Wave. If Duke gets sloppy with the ball, the results could be disastrous. Tulane will be the fastest team Duke has faced in 2014 so Duke must be prepared to counter speed with speed and solid fundamentals. Players must execute their assignments and tackle and block with precision. Tulane has the speed to convert a small mistake into a big advantage. The Blue Devils are looking to wrap up the out-of-conference schedule with a victory to improve to 4-0 on the season and equal last season's non-conference record. 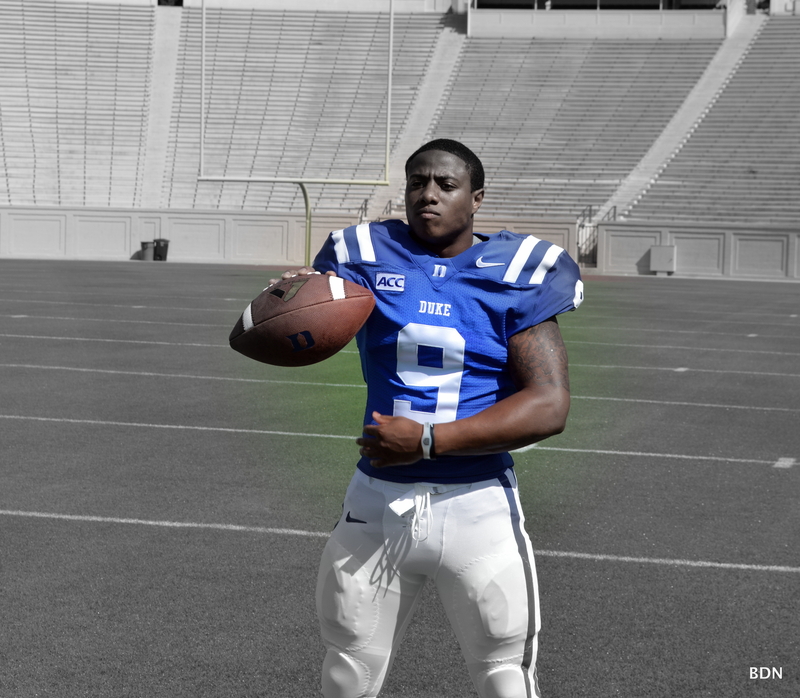 After being held to 14 yards on two receptions last week, Jamison Crowder will crank up his star power and combine with quarterback Anthony Boone to lead the stacked Blue Devils offense to victory. On defense, Duke will emphasize keeping the plays in front of them to limit explosive opportunities to Tulane's offense, while mixing in blitz packages in an effort to create turnover opportunities. 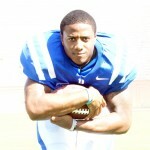 Finally, Duke will utilize superior athleticism to dominate on special teams to win the vital field position battle. With Tulane facing a long field and Duke playing on a short field it will be a long afternoon for the Green Wave. Duke has too many offensive weapons for Tulane to handle. Add to the mix a Blue Devils defense that has allowed opponents to score only 10 points in the 2nd half through three games, against a turnover prone Tulane offense and this event ends up as a game where Duke opens it up in the 4th quarter to win by four touchdowns. The Troy Trojans made a trip to Durham a year ago, falling to the Blue Devils, 38-31. This year, Duke returns the favor with a visit to Troy, Alabama in week two. Behind four touchdowns from Anthony Boone, Duke cruised to an easy win in their opener against Elon, while the Trojans were trampled on the road by the UAB Blazers, 48-10. On his weekly conference call, OC Scottie Montgomery said to be at their best, the Blue Devil offense is all about balance. A balanced attack from Anthony Boone and company should consistently find the end zone against a Troy defense that allowed 338 rushing yards to UAB and finished 115th against the pass in 2013. Troy HC Larry Blakeney stated this week that the Blue Devils will represent the best offensive line the Trojans will face this season (and Troy will face Georgia in week 4). The key to a balanced offensive attack starts at the line of scrimmage, where Duke will need to impose their will against the struggling Trojan front seven. 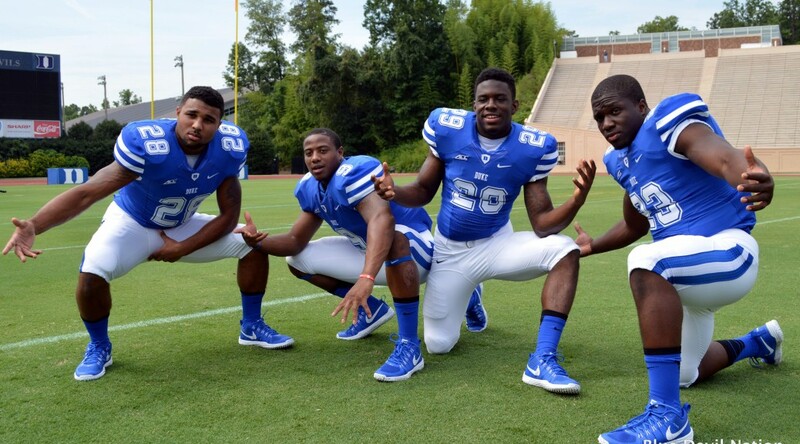 Expect to see Duke once again rely heavily on veteran RBs Josh Snead and Shaquille Powell as they look to impose a fast pace and consistently move the chains. Defensively, DC Jim Knowles is likely to implement a more aggressive gameplan than against Elon, looking to turn up the heat on young redshirt-freshman QB Brandon Silvers. A big night from the Duke front six will force the young Trojan offense into turnovers, something they were unable to do against Elon in their opener. The one glaring weakness in Duke's effort against Elon was in the kicking game, where the Blue Devils were out-hit by the Phoenix. Coach Cutcliffe spent significant time analyzing the kicking game struggles and expect to see a better effort from Duke in week 2. On their way to a 10-2 regular season, the Blue Devils survived a scare at home against the Trojans a year ago. It would be foolish to overlook this year's Troy team simply based on their week one result. Head Coach Larry Blakeney and his staff will have the Trojans ready for their home opener (Troy is 22-1 in home openers under Blakeney). On the road against a quality opponent, the Blue Devils cannot afford to make things easy for the Trojans. Ball security is paramount for a Duke offense that on paper should be able to move the ball with ease. On the road, explosives can give a home team all the momentum it needs to pull off an unlikely upset. Add in a rowdy home crowd (yes, they will be serving adult beverages in Troy), and a few key plays could be all it takes for the tables to turn on Duke. The Blue Devils' surrendered a few explosives in the return game against Elon, and a similar missed assignment on the road could lead to a game-changing score. 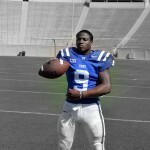 Similarly, Duke's young secondary must keep the Trojan receivers, led by Chandler Worthy in week one. If Troy jumps out to a lead, expect them to try and ride their own four-headed running back committee of Brandon Burks, Jordan Chunn, Khary Franklin and Tim Longmire to victory. The Trojans are searching for a defensive identity and the Blue Devils' offensive playmakers will leave them searching for answers. As they did for most of their season opener, Duke will control the line of scrimmage on both sides of the ball. Multiple Duke RBs will find their way into the end zone, while the Duke WR trio of Jamison Crowder, Issac Blakeney, and Max McCaffrey will continue their early season success. Carlos Wray and company will frequent the Trojan backfield and Troy will again struggle to convert on third down. As they did a year ago in week two at Memphis, expect the Blue Devils to face their first true adversity of the season on Saturday at Troy. The Trojans will be motivated to bounce back after an embarrassing opening week loss, and will keep this close early. Behind a big day from #TheStable and a bend-but-not-break defense, Duke pulls away in the second half. When heavily favored Duke takes on Elon to open the season this Saturday in Wallace Wade Stadium, don't expect the Blue Devils to be caught looking ahead. 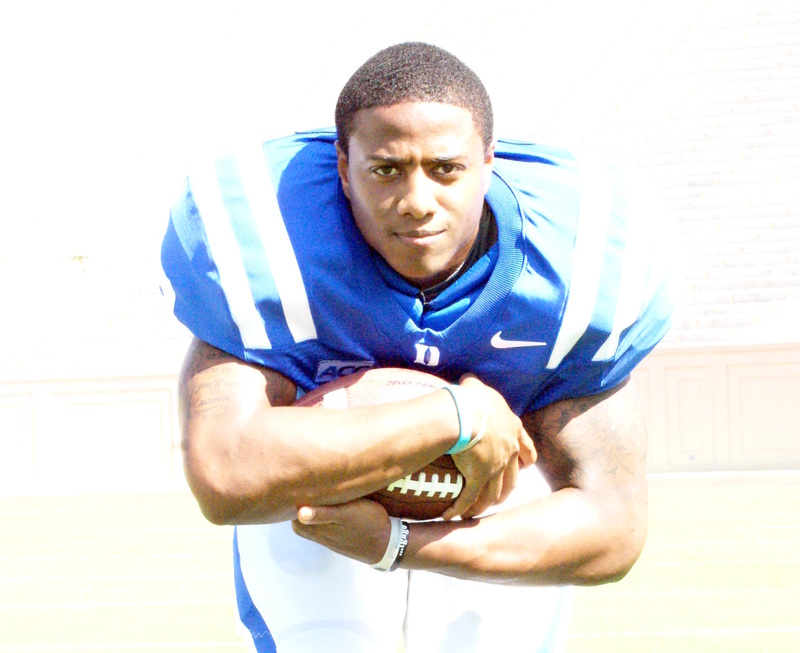 "We're going to approach this game just like it was an ACC game," said Duke senior running back Josh Snead. At the same time the star runner followed up by immediately saying, "We've got the mindset that we want to come in and dominate." There is no doubt that the Elon game is considered to be the easiest game on the Blue Devils schedule, but there seems to be a focus of importance that the team needs to start the season playing well and carrying over the momentum from last seasons epic 10-4 mark, the most wins in school history. "If you look back at the Texas A & M game, we played a great game and a few plays here and there and it would have been different," said Snead. "We feel like we can build off that and capitalize going into this season." There is always heightened curiosity going into a season opener for every team. That certainly holds true for a Duke team where some have still questioned whether they can continue the success of a season ago or if they can match that intensity where they rolled off eight consecutive wins after a 2-2 start. "We feel that we've put in the work in camp -- a lot of hard work, said Snead. And a look around the pre season camp seemingly shows that with players look to be in good shape. After all, some of the younger Blue Devils know nothing but bowl games and that is a far cry from decades of not so great football. "I know some feel that last year our program was a fluke," said Snead. "We've got great coaches here who help us to sharpen our skills and fundamentals each week to go out and compete with the best." Snead stated what many have seen in practices, that players are on the same page, get to there stations quickly when the buzzer sounds and that kind of thing plays a big role on game day. One of the main off-season concerns and a natural one after a 10-4 turnabout, is the fact that the Blue Devils had great leadership a year ago and it can be replaced. "This year we are trying to be even better leaders. We have a lot of guys believe in what Coach Cut has presented to us. His mission, his plan, his vision." said Snead. Josh Snead is never one who is short for words when dealing with media, but he is also a player who seems poised to show off what he has learned on and off the field. Snead is the type of player that finds ways to contribute be it a timely blocked punt in the Chic-Fil-A Bowl game or working to make sure newer Blue Devils continue to build on success. "With me being one of the leaders, I try to help him out a lot. Anything he needed help with we go over." said Snead with concern to true freshman running back Shaun Wilson currently slated to see time at the position this season. Snead is one of a handful of redshirt seniors that in time will be considered some of the first building blocks for the resurgence of Duke Football under David Cutcliffe. And this Saturday, another chapter in that story is set to begin.